Art 7 Vacancies in membership: if any member who has been invited by the original members, shall withdraw for it from the society (by removal from town or otherwise) the member by whose invitation she joined, shall have power to fill the vacancy. And if any of the original members shall withdraw the vacancy may be filled by a vote [the?] [illegible]. Art 8. Amendments: This Constitution may be altered or amended by a vote of the majority- of the society- as any regular meeting. Respectfully submitted Mrs E. Latham Mrs [G?]. 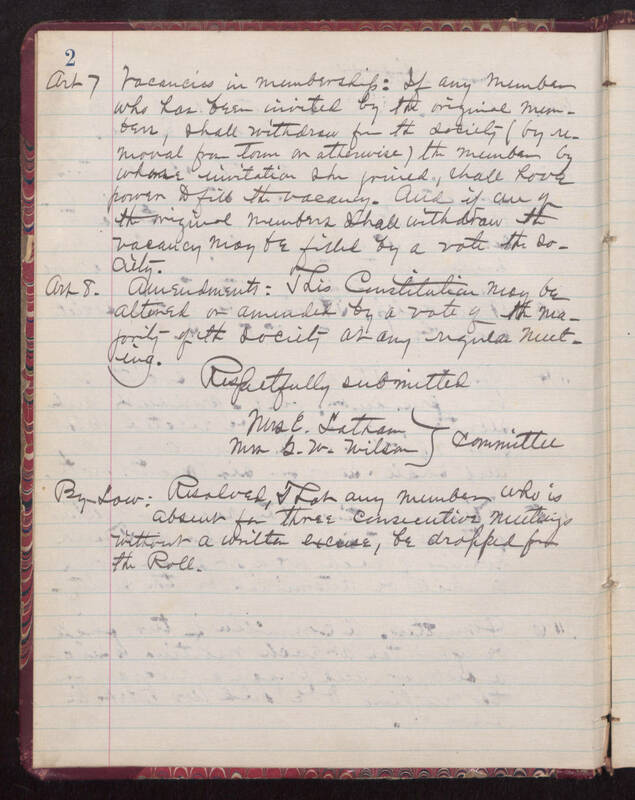 W. Wilson Committee By-Law: Resolved, That any member who is absent for three consecutive meetings without a written excuse, be dropped from the Roll.